Bhimbetka rock shelters, Madhya Pradesh: Rock Shelters of Bhimbetka are located about 45 km south east of Bhopal on the road to Hoshangabad. The site spread over 10 km in length and about 3 km in width has more than 700 rock shelters, of which over 400 have paintings. The earliest human activities are known from the numerous stone tools including handaxes, cleavers and also the pebble tools. The latter pertinently was found in primary contexts. The continuity of human evolution from the Lower Palaeolithic Period is noticed by the smaller size of stone tools in the following Middle Palaeolithic Period besides new tools like scrapers. During the Upper Palaeolithic Period newer tool types like: blades, borers and burins had also emerged. However, it is in the Mesolithiic Period that there is a clear change in the materials and tool typology. Earlier, the tools were largely made of quartzite and sandstone, whereas the tools being made in the Mesolithic Period were most often of chalcedony. The stone tools of this period include blades, triangles, trapezes, crescents besides quern and muller. Bhimbetka owes its name to the characters of the longest epic in the world, the Mahabharata. It is believed that when the five brothers, called Pandavas, were banished from their kingdom, they came here and stayed in these caves, the massive rocks seating the gigantic frame of Bhima, the second Pandava. Further evidence, cited in support of this theory, is the resemblance in names of the nearby places with the names of the Pandavas. Thus, one of the villages is known as Pandapur. While Bhiyapura itself is believed to be a distortion of Bhimpura. As regards the surrounding Lakhajuhar forest, it is said that it was the Pandava’s palace, built of lakh (was). However, the veracity of these claims still remains to be corroborated with concrete evidence. Bhimbetka is a natural art gallery and an archaeological treasure. For miles together, the footsteps of the prehistoric man can be easily discerned upon the sands of time, since the caves here house rock paintings, created by man from as early as about 15,000 years ago in vivid and panoramic detail. 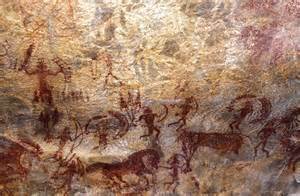 The rock paintings have numerous layers belonging to various epochs of time, ranging from the Upper Palaeolithic, Mesolithic Age to the protohistoric, early historic and medieval periods. The most ancient scenes here believed to be commonly belonging to the Mesolithic Age. These magnificent paintings can be seen even on the ceiling of the rock shelters located at daunting heights. Discovery: The caves of Bhimbetka were discovered in 1957-58 by one of the great accidents of history. An intrepid archaeologist from Vikram University, Ujjain, Dr. Vishnu Wakankar, strayed too far from the beaten path and found himself amidst this prehistoric treasure trove. In due course of time, the archaeological excavations yielded remains, serially from the Lower Palaeolithic Age to the Early medieval Ages.